More than $30 million in retail development deals have been finalised in Queensland in recent weeks as investors demonstrate an increasing willingness to move up the risk curve, according to CBRE. In one of the most recent transactions, Engage Capital, in partnership with Evans Long, has reached an agreement to sell the Augusta Village shopping centre in Ipswich (pictured) in a fund through development deal valued at $10.8 million. It is the second such deal in as many weeks for the Engage Capital/Evans Long partnership, following an $18 million fund through deal on the Calliope Shopping Centre in far north Queensland. CBRE’s Nick Willis and Michael Hedger negotiated both transactions, in addition to a third deal involving the sale of a DA-approved shopping centre site in Caboolture. “We are finding with the continued increase in competition in the neighbourhood shopping centre market investors are moving up the risk curve and exploring fund through deals and development opportunities,” Mr Hedger said. In the case of Augusta, the deal involved the sale of a development site in the master-planned Springfield growth corridor. A private investor has acquired the 6,101sqm site and will progressively fund the construction of a 1,645sqm convenience centre under a development management agreement. Mr Hedger said the Expressions of Interest campaign had fielded over 60 direct enquires. The purchaser exchanged unconditional contracts the night before close of the campaign at a price which reflects a yield on completion of 7.42%. 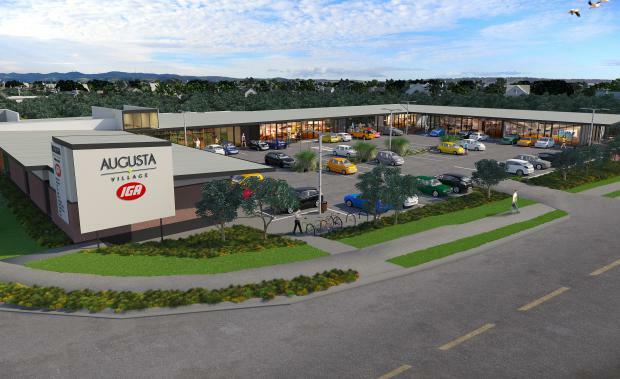 IGA has signed a 15-year lease to anchor the centre, which is being developed on Leon Capra Drive in Augustine Heights, 35 kilometres south west of the Brisbane CBD. “The centre offers a secure income stream from national and local retailers and appealed to investors looking for strong depreciation benefits and significant acquisition cost savings,” Mr Willis said. The Engage Capital/Evans Long partnership recently finalised a similar deal for the Calliope Shopping Centre, although in that instance the transaction was to fund the extension of an existing centre at Gladstone. The Calliope deal will allow for a significant expansion of the existing anchor to become a full line, 2,422sqm supermarket on a brand new 20 year lease to Drakes Supa IGA. In a third transaction, CBRE has sold a 17,140sqm, DA-approved development site in Caboolture to a private investor for $3 million. The 1 Ardrossan Road property has approval for a 3,000 supermarket supported by a drive through facility and 790sqm of specialty retail. The corner property is strategically positioned in the rapid northern growth corridor of Caboolture, opposite a proposed state funded school. Whilst there is no pre-commitment from an anchor supermarket, Mr Willis said strong interest was expected from major supermarket operators. “Continued low interest rates and increasing offshore investment in the Australian real estate market, underpinned by the secure annuity style returns offered by retail investments, ensure a sustainable and positive growth environment for neighbourhood shopping centres,” Mr Willis concluded.